LTScotland reports on an interesting region-wide project to incorporate symbols into mainstream schools in Fife. Fife Assessment Centre for Communication through Technology (FACCT) is a Fife-wide service supporting clients for whom speech is not their main means of communication. Symbols are images which are used to make meanings clearer and easier to understand by providing a visual representation of a single word or a concept. It is important to understand that symbols are different from pictures. A picture conveys a lot of information at once and its focus may be unclear, whereas a symbol focuses on a single concept and by grouping them together more precise information can be conveyed. Initially, staff became aware that using symbols consistently in a mainstream class was not only supporting a child with an identified learning disability but was meeting the needs of many children who had no recognised learning or communication impairment. Symbols packs were developed and offered to classes throughout the school and were quickly taken up by other members of the teaching staff as they realised the benefits they brought to pupils’ overall development. There is a consistent approach to the symbols used in all the establishments involved. This ensures that pupils transferring from one environment to another are familiar with any symbols in use, no matter which establishment they are in. The chosen symbol software package used to create the resources was Mayer-Johnson’s ‘Boardmaker’. • The Mathematics and Home Economic Departments began using symbols to help pupils establish a routine once they entered the classroom. This supported a positive ethos within the classroom. • Pupils use personalised symbolised timetables. Learning and Teaching Scotland, in partnership with CALL Scotland are hosting this learning day. · to support teachers, early years practitioners and senior managers to improve access to the curriculum for pupils with print disabilities who need print to be in accessible alternative formats. · to encourage individuals in their authorities to share their learning with colleagues to sustain and expand work in this area. Significant developments have taken place to make it easier for pupils and teachers to find existing accessible resources, to use them with pupils, to make them if they don’t already exist and to share them under new copyright arrangements. These developments will help authorities and schools to meet their equality and accessibility responsibilities. LTS plans to involve colleagues from Scottish Government, HMIE, CALL Scotland, SQA, CLA, RNIB and publishers as well as managers and practitioners. This partnership event is aimed at both educational practitioners and strategic personnel. To reserve a place at this event please contact Anne Marie Lamont at a.lamont@LTScotland.org.uk. 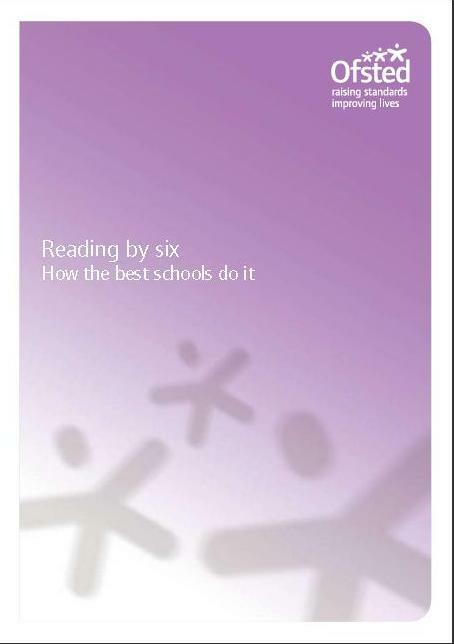 The February edition of Research Roundup links to a document, Reading by Six: How the Best Schools Do It, Manchester: Ofsted. This is a report which presents the findings of research into good practice in teaching children to read in England. The study examined practice in 12 schools in England that were assessed as outstanding in their last inspection. The sample included four infant and nursery schools and eight full-range primary schools. Inspectors observed over 100 phonics and reading and writing sessions in order to assess how they were teaching children to read. The research found that the best primary schools can teach virtually every child to read, regardless of socio-economic circumstances, ethnicity, the language spoken at home and most special educational needs. The study indicated that primary schools, including infant schools, can achieve very high standards in reading if they focus on this objective. Success was found to be based on the determination that every child will learn to read, together with a sustained and sequential approach to developing speaking and listening skills. Concentrated and systematic teaching of phonics was crucial. The best phonics teaching was characterised by planned structure, fast pace, praise and reinforcement, perceptive responses, active participation by all children and evidence of progress. Effective assessment of children’s progress and identification of difficulty in reading was also a key success factor. The largest book give-away ever attempted! World Book Night will take place on Saturday 5 March 2011. This dynamic and unprecedented industry-wide initiative to celebrate adult books and reading will see one million free books given away on World Book Night by 20,000 passionate readers to other members of the public across the UK and Ireland. World Book Night will take place two days after World Book Day, the established nationwide reading campaign. The CALL Centre recently published a report on the use of accessible digital exam papers in the 2010 diet of exams run by the Scottish Qualifications Authority. These papers allow pupils with disabilities to sit the same exams as their peers, but using a computer to type their answers, and where required read the text from the paper, rather than rely on readers and scribes. The report is available from the digital papers web site, www.adapteddigitalexams.org.uk/Downloads/Reports/. The report highlights the spectacular increase in the number of school pupils sitting exams using digital papers since they were first introduced in a pilot supported by CALL in 2006. Last year 101 centres made 2000 requests for digital papers on behalf of 675 candidates. Compared with 2009, this represents a 71% increase in the number of requests, a 38% increase in the number of centres, and a 60% increase in the number of candidates. The use of digital papers increases the independence of pupils, who no longer have to be supported by readers and scribes and can lead to financial savings for schools. The CALL Centre believes that Scotland is the first country in the world to introduce accessible digital exam papers for national certificate exams in schools, but we would be keen to hear about experiences in other countries. Join the discussion on the adapted papers blog at http://www.adapteddigitalexams.org.uk/Blog/. 31 Mar 2011 – Creating Adapted Digital Prelims and Resources for Pupils with Additional Support Needs. Training can also be provided in schools and local authorities. Further information is available in the Training section of the CALL Scotland web site. A group of Support for Learning Teachers has created pupil friendly guidance sheets on using MS Word to access the curriculum, ‘Suppporting Literacy with MS Word’. Check them out in the ASN Glow Group or in the Support for Learners folder in Education Exchange. With acknowledgement to the work of the CALL Centre and Books for All: meeting the needs of ALL learners. Books for All is about creating and providing access to learning materials in accessible, alternative formats. Do check out the website or enter through Glow. Graham Donaldson launched the report of his Review of Teacher Education last week, which he was asked to undertake by the Scottish Government. Here is a link to the Press release. 1. Teachers should be confident in understanding and addressing the consequences of various barriers to children’s learning and their needs for additional support. 2. All new teachers in Scotland should be aware of the key challenges we collectively face, such as improving standards of literacy and numeracy and doing more to overcome the effects of disadvantage and deprivation on educational outcomes, and contribute personally to addressing these. The Scottish Government intends to discuss the recommendations with key partners including Dyslexia Scotland, local authorities, Schools and universities, before the Government responds. East Lothian Council reports that during the next few weeks all P1 children will receive a free book with a message from Bookbug, the Scottish Book Trust’s Early Years Gifting Programme. 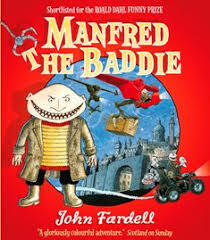 This year’s chosen book, “Manfred the Baddie” by John Fardell, won the 0-7 age category of the 2009 Royal Mail Awards for Scottish Children’s Books. John Fardell will be taking part in a live Glow Meet in the Early Year’s Glow Group on Thursday 25th November from 1.45 – 2.45pm. The Scottish Government announces that the rights of children with additional education support needs will be strengthened on Sunday (November 14) when the Additional Support for Learning (Scotland) Act 2009 comes into force. It will ensure that children and young people with additional support needs and their parents can make out of the area placing requests for specific schools and receive mediation and dispute resolution help following such requests. It will also increase parents’ access to the Additional Support Needs Tribunals for Scotland (ASNTS) if a placing request is refused.